R.G. Armstrong passed away in his sleep on July 27, 2012. He was 95. Born Robert Golden Armstrong on April 7, 1917 in Birmingham, Alabama. He attended the University of North Carolina at Chapel Hill. While there he was frequently performing on stage with the Carolina Playmakers. Although his mother had hoped he would follow the ministry, ffter graduating, R.G. headed to New York, where his acting career really took off. In 1953 he, along with many of his Actor's Studio buddies, was part of the cast of "End As a Man" -- this became the first play to go from off-Broadway to Broadway. The following year, R.G. got his first taste of movies, appearing in “Garden of Eden” (1954). However, he returned to New York and the live stage. He received great reviews for his portrayal of Big Daddy in the Broadway production of "Cat On a Hot Tin Roof" in 1955. In 1958 he took the plunge to Hollywood and appeared in two movies, a TV series, and numerous guest appearances on TV shows that year, usually in westerns such as "The Rifleman" (1958), "Have Gun - Will Travel" (1957) and "Zane Grey Theater" (1956), among others. 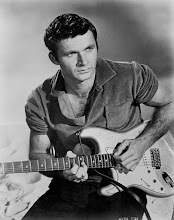 He would go on to appear in 80 movies and three TV series in his career, and guest-starred in 90 TV series, many of them westerns, often as a tough sheriff or a rugged land baron. R.G. was a regular cast member in the TV series "T.H.E. Cat" (1966), playing tough, one-handed Captain MacAllister. Although most of us remember R.G. as a regular in several Sam Peckinpah films, the younger generation knows him as spooky Lewis Vandredi, who just wouldn't let the main characters have a good night's sleep on the "Friday the 13th" (1987) TV series. Finally retiring after six successful decades in show business, his last film appearance was in the TV western film “Purgatory” (1999). Mr. Armstrong had been blind for the past few years he enjoyed listening to old radio programs and the Encore westerns channel. Armstrong received a Golden Boot award in 1999. R.G. 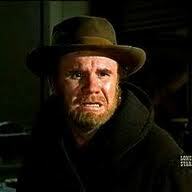 appeared in one Euro-western as Honest John in “My Name is Nobody” (1973). Born: 4/7/1917, Birmingham, Alabama, U.S.A.
Died: 7/27/2012, Los Angeles, California, U.S.A.